Located close to the border with Switzerland, Besançon is the capital city of the Franche-Comté region of northeastern France. As of 1999, the city had an urban population of 134,376, with 222,381 living in the metropolitan area. Besançon is a city in eastern France, located close to the border with Switzerland. Besançon is the capital of the region of Franche-Comté. As of 1999, Besançon had an urban population of 134,376, with 222,381 living in the metropolitan area. Besançon is a city with a very ancient history. Julius Caesar first mentions the town (under the name Vesontio) in his Commentarii de Bello Gallico (Commentaries on the Gallic War) in 58 BCE. Gallic tribes are however in fact believed to have settled the area as long ago as 1,500 BCE. Besançon has been ruled by many states during its history, including being part of Charlemagne's Empire, the Holy Roman Empire, beind independent, under the Duke of Burgundy, and under Spanish and French rule (changing hands repeatedly between them). It was also important during the Napoleonic Wars (the town was bombarded by the Austrians in 1814), the Franco-Prussian War, and occupied by the Nazis during World War II. When conquered by Louis XIV of France in 1668, the famed military engineer Sébastien Le Prestre de Vauban visited the city and drew up plans for fortifications. The French then however immediately lost control of the city back to Spain, but regained it again six years later. Vauban, then returned and organized building many fortifications (including city walls, a moat system, numerous forts, and a citadel), a process which took 30 years.Most of these fortifications can still be seen today. 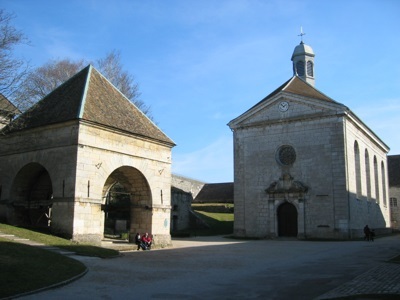 In 1959, the French Army turned the citadel over to the city, and it subsequently became a museum. Since 2008, the Citadel of Besançon has been listed as a UNESCO World Heritage Site. Besançon has both oceanic and continental climate influences. As a result, it tends to have quite a lot of precipitation, but hard winters (with snow and frost), and warm dry summers.